This is a caption to a picture that Stuart drew for mom. 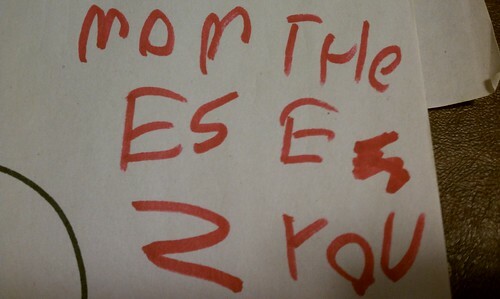 It reads "MOM THEES EZ YOU" and captions a picture of a candle. It makes me somewhat sad on a couple fronts. The first is that Stuart does this for mom all the time. At the time he did this, he hadn't yet done that for me and I was feeling jealous (at the time of this writing, Stuart had left a note for me when I came home from community band that he wanted me to build a wall in front of his door made from cardboard "bricks" (likely so he could smash through it in the morning). I did so - I built a humble but interesting-looking wall. He complained loudly about it at breakfast. I can't win). The second reason is that I'm still waiting for Alice to write these notes. It's rough. Stuart is far ahead and Alice is far behind in terms of writing skills (spelling, motor control, desire). I can't wait. I'd gladly take getting dissed. I don't know why skating is important to me. I think it has to do with the fact that it's really hard to get Alice out and active in the winter. She's reluctant to go out in the snow and there isn't a terrific motivation, and if she's out with her brother, he can end up roughing her up in ways that don't allow her to retaliate other than yelling at him. It's not particularly fun. When she was smaller, we had her out on the ice on very wide double-blades. They worked OK, but she wasn't very confident. Later, we got a pair of single blade skates and tried her out on the ice. She was happy with the idea, but terrified with the reality, and understandably so. It doesn't help that I don't know how to teach beginning skating. I tried a couple other things and then started to rely on using a sled hockey sled, which while it got her out of the house, puts her in a completely passive role. I'd like her to be more active. The Learn to Skate program has been very welcoming and I brought her out last week to do sled riding. The director of the program told me that her could get her to skate and told me how to prepare her. We practiced on the skates taking "mouse steps" on carpet. I brought her out with snow pants, warm clothes, skates and a helmet and a good attitude. Over all, she took 7 assisted steps on the ice - more than I was expecting. It was challenging. They wanted me on the ice, which I was not expecting - Alice fights me in challenging situations and is more likely to completely give up, which she demonstrated by making it perfectly clear that she was only going to work with the coaches, not me. Yet, this is the element of parenthood that I do because I don't know what else can or should do. I was kneeling down on the ice in front of Alice acting as support, while I my pants under my knees were freezing to the ice. 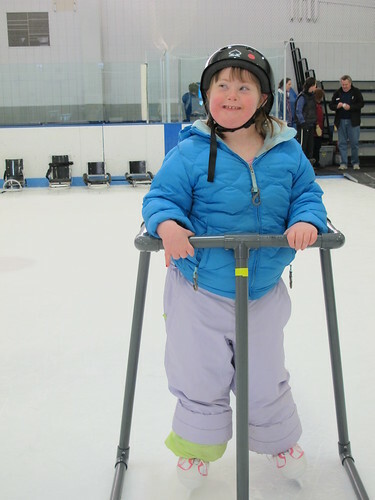 The rink also hosts an Adaptive Skating program. I have been trying to get her to this for some time, but her schedule hasn't worked out well. We went today and I found that they were well equipped, but ill-prepared for Alice. They had a lot of good equipment, but not expertise, which is sad. I was hoping that they would have some people who I could talk to about Alice's challenges and offer constructive suggestions on how to do what we do better. Alice is in a funny space - she's not so handicapped that she needs a wheelchair, but she's handicapped to the point where walking is a challenge and skating even more so. I did more of what we did yesterday and then tried her with a walker, which you see above. I was very surprised at how well she did with it, but at some point she decided that she was through working and that she couldn't do any of this and that her foot hurt and that the world was coming to end, and so was skating. No more. I fought with her to get her to move herself to the bench and take a break. While tears were slowing, I tried to figure out how to end this on a positive note. Alice led me to that by getting up and learning over the bench and playing with the push handle on a sled. I asked her if she wanted to ride in the sled. Yes! I said that if she could take three good baby steps on the ice, we would do the sled. She was up in a second and was nearly on the ice ahead of me. I knelt back on the ice and offered a little support and she did a very quick and well-defined 1-2-3, while counting out the steps. Done. Put me in the sled. I had her do it again. She did. And again. She did. So at the end, I had her do 9 steps in succession - more than she did in total at Learn to Skate, just to get into the sled. Hopefully we can do the Learn to Skate next week. This year for Christmas, we got a number of games for the family. We got Family Fluxx, Sequence for Kids, and Uno. Fluxx is a fun game, but my youngest can't read well enough yet to play and Alice has a very hard time with the changing rules. It's frustrating, but the other games work better for her. 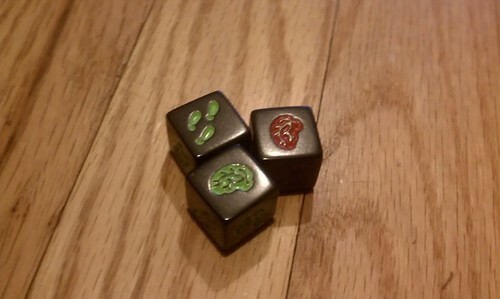 Pictured above is Zombie Dice by Steve Jackson. This is a fun game because it's silly, it's part luck, and part skill to play. Alice likes rolling the dice and doesn't need too much help in the game play. Playing games is a good thing - it helps the kids develop strategy, follow rules, and take turns. It's also a chance to make decisions and exert control, which is also a good thing.